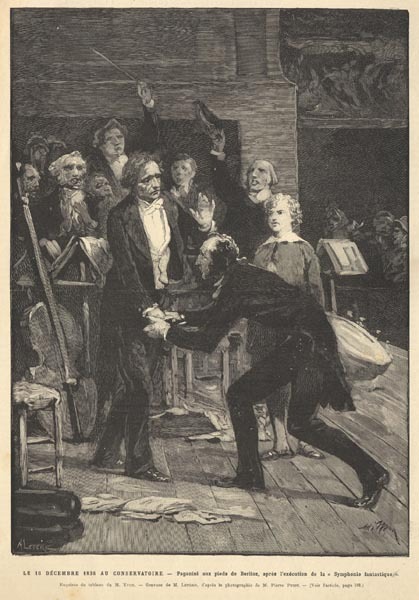 This engraving of a painting by Adolphe Yvon (1817-1893), published in Le Monde Illustré, 22 March 1884, represents a scene at the Paris Conservatoire after a concert given by Berlioz in December 1838. The original painting entitled ‘Hommage de Paganini à Berlioz lors du concert du 16 décembre 1838’, is in the Médiathèque, Cité de la musique, Paris. You may read elsewhere on this site the French original text and our English translation of the article on page 182 of Le Monde Illustré in which the story behind the painting has been related. The above engraving and its related article have been reproduced on this site from our own copy of Le Monde Illustré, 22 March 1884. © (unless otherwise stated) Monir Tayeb and Michel Austin for all the texts and images on Berlioz Photo Album pages..